Very little is known about the people who lived before the Great Flood. Genesis chapters 2 through 7 provide a synopsis of that age. Ancient Jewish writings provide more possible detail. However, no archaeological discoveries have been made which would reveal additional information about this lost society. Therefore, scripture is all we have to rely on. Of the many issues concerning the flood, a common question that has often been asked is: "What was the world population when the flood occurred?" Most people have been taught that the population might have been in the tens of millions or perhaps in the hundreds of millions. Using an electronic spreadsheet, an analysis was made of the effects of population size using the numerical values provided in the book of Genesis for age of childbirth, number of children per family and life-spans. The book of Genesis identifies the life-spans of the antediluvians as approximately 900 years (Masoretic Text). This is obviously different from the life-spans of today. According to Scripture, the ages at which the antediluvians had children range from 65 to over 100 years of age. Also, their families would most likely be much larger than today's. With 900 year life-spans, it would seem that the effects of disease on their society would be much different than ours today. These variations would seem to change the traditional generation lengths and family sizes used in today's population growth calculations. 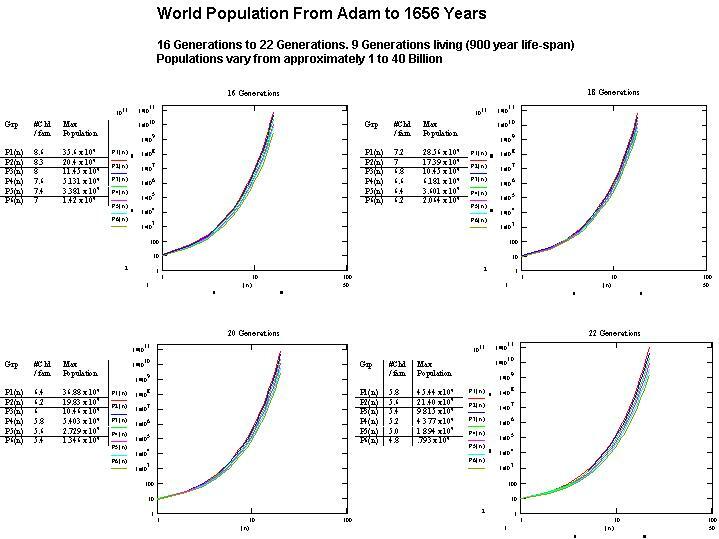 Based on the numerical values in Genesis, the life-spans, generation lengths, and childbearing ages were analyzed using an electronic spreadsheet called Mathcad 7 (2). The results were plotted and range of probable values determined, representing the world population at the time the flood occurred. Figure 1 shows a chart of the antediluvian life-spans, childbirth ages, and number of minimum children per family. 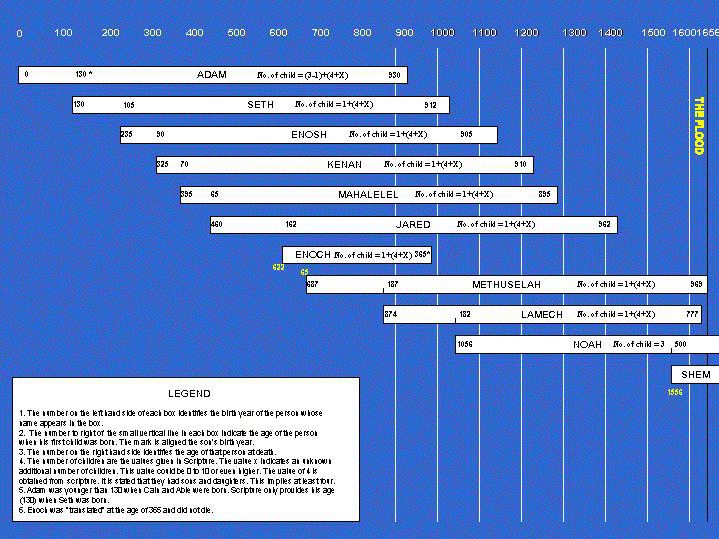 The chart covers from the creation of Adam out to 1656 years where the flood is believed to have occurred. All information contained in the chart was taken from the Book of Genesis. The population was calculated using the formula given below. This formula was published by Henry Morris (3) and calculates the population of the world at the time of the Flood. P(n) is the population after n generations which begins with one man and one woman. The number of generations is represented by n. A value for n can be obtained by dividing the total time period by the number of years per generation. The number of generations that are alive when P(n) is evaluated is represented by x. For example, if x equals 2, the generations that are alive are generations n and n-1. The value of c represents half the number of children in the family. If each family has only two children c would equal 1 and the population growth rate would be zero. 1. Sixteen generations (n=16), each generation is 103.5 years. The life-spans are 900 years (x=9). The calculations begin with 10 children per family and are minimized to 3 children per family. 2. Eighteen generations (n=18), each generation is 92 years. The life-spans are 900 years (x=9). The calculations begin with 10 children per family and are minimized to 3 children per family. 3. Twenty generations (n=20), each generation is 82.8 years. The life-spans are 900 years (x=9). The calculations begin with 10 children per family and are minimized to 3 children per family. 4. Twenty-two generations (n=22), each generation is 75.3 years. The life-spans are 900 years (x=9). The calculations begin with 10 children per family and are minimized to 3 children per family. Genesis Chapter 5 states that each person had "sons and daughters" in addition to the son whose chronology is given. Since a plural is used to describe the number of sons and daughters, a minimum of two sons and two daughters are assumed. Therefore, a reasonable value would appear to be a range of 5 to 8 children per family. As previously stated, Adam and Eve had seven children. Using 5 to 8 children per family, the population falls with in a range of ~2 billion to 11.5 billion (over the range of 16 to 22 generations). (Refer to last four tables at end of section.) It is interesting that today's population of approximately 6 billion fall within this category. A reasonable value for the antediluvian childbearing age appears to be approximately 90 years. Genesis uses a range of 65 to 500 years, for the first born in the families that are listed. Noah is the only one mentioned who waited 500 years before starting his family. We are not told why. Therefore, Noah is an exception to the standard. (As mentioned above, Noah could have had other sons and daughters who are not recorded.) The other oldest were Methuselah (187 years), Lamech (182 years) and Jared (162 years). The rest began their families at between 65 and 105 years of age (see time-line chart). Adam is listed as being 130 when Seth was born. We don't know his age at the time Cain and Abel were born. The age of the antediluvians when they started their families is rather strange in contrast to today. These ages appear to indicate that for some unknown reason, they may have been incapable of reproduction until around the age of 65 years. As previously mentioned, other ancient documents as well as others such as Barry Setterfield have suggested a time span of 2256 years between creation and the Flood. If this were true, then it would effect the population results, driving the population far higher. In this case, it would mean the population was much higher or the family sizes were lower than scripture indicates. If the population reached over a billion, there would tend to be some logistical problems in feeding and caring for the population (clothing, housing, jobs, etc). This indicates that they would have required a higher level of technology than what we currently give them credit for. Had their population reached over 10 billion, they would have required similar technology as we have today (rail, refrigerated shipping, sophisticated farming methods, fast and reliable communication, etc). 2. Mathcad 7 is a product of Math Soft Inc. Cambridge MA. 3.. Henry M. Morris, The Biblical Basis for Modern Science, Baker Book House, 1984, p.417. Excerpt. See also World Population Since Creation, also on this web site. April 8, 1998. Revised, April 16, 1998, August 12, 1998. Updated October 7, 2004.